The Real Justice series is a really interesting one. All of them tell the story of a teen or young adult in Canada who were accused and convicted of murder. Some were false accusations, some were horrible miscarriages of justice. 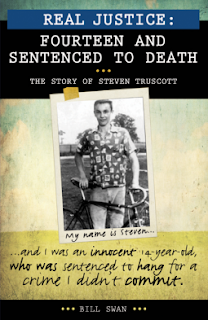 Steve Truscott's story is particularly gut-wrenching for me. What was clearly circumstantial evidence, no confession, and gross mismanagement of a case by the police (who stopped looking when it came to light that Steve was the last to see Lynne alive) led to a fourteen year old be sentenced to death by hanging. This book will appeal to reluctant readers, the "bad boys and girls," and the kids very into shows like CSI. This isn't a "true crime" novel, in that it's not about the crime committed itself, but the aftermath for the accused, and subsequently cleared, Steve Truscott. Excellent read. Swan does a nice job of reminding us all that we really need to be aware of what our rights are, before they disappear on us. I reviewed another in the Real Justice series earlier this year: Sentenced to Life at Seventeen. Really interesting premise. James, in an effort to gain attention and approval from his older brother, finds himself taking the fall for him instead. Even winding up in juvie because his brother abandoned him. The story is really interesting, a provides a better understanding of what life "inside" is and can be like in a facility like this one. By no means do I think I "get it," but I can see some of the good and the bad in this story. I think this will make an excellent book for a reluctant reader, or an all boy book club for discussion. James is committed to maintaining his inner self--a good, good guy--while still keeping himself "strong" in the eyes of his companions. It's a delicate balance, and one that his positive mentors see in him. James is a reader, something you don't quite expect in this situation. And not only that, he reads literature, not just junk stuff. He is a deep thinker, and finds a connection with Jack London's writing, while sitting in a juvenile detention facility. Ultimately, it's all about the choices you make, and James not only learns this but teaches it as well. In April, I rolled off of the Texas Maverick Graphic Novel Reading Committee (under the umbrella of the Young Adult Round Table and Texas Library Association). It marked the first time in 6 years I wasn't required (because I chose to serve on the committees) to read things that would appeal to my students. Since then, I've gone "hog wild" reading whatever I want. Which is still a lot of YA literature, but fewer graphic novels. I've also picked up several things that are marketed towards adults that would likely see limited interest in YA collections. For example, I LOVE novels set in Tudor England...but can't name one high school kid at my school who would devour them the way I do. The thing is, I can't review those books here because they don't fit into the scope that I've put together for Mean Old Library Teacher. So, because I suspect that at least a few of you also read other things, I've started a second review blog. The Other Stuff I Read is still in its infancy, but I'll work with it as much as I do this one. Often, books that I label "Adult for YA" or "YA for Adult" because they'd have crossover appeal will be reviewed on both blogs. While it won't always happen, I'll try to make some pointed comments on those crossover books that explain why I'm posting it to each blog (like...why I think that it'd be great for adults but it's a YA book). As always, I'm looking for anyone who'd love to review along with me...either here at Mean Old Library Teacher, or on The Other Stuff I read. Feel free to comment here, or contact me at meanoldlibraryteacer at gmail dot com if you'd like to join the team. I know it seems I do that a lot...just "Wow." And then want to stop in my review because I don't really know what else to say. Proxy is a very well thought-out and written dystopian take on concept of a "whipping boy." (There's been a couple of well-known books with this line...The Whipping Boy, by Sid Fleischman---the Newberry winner in 1987--, and Mark Twain's The Prince and the Pauper.) 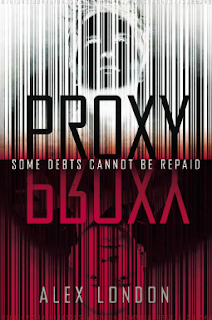 Basically, Knox, the well-off trouble-maker, does things that need to be punished, but is considered to high class (society-wise) to be actually punished himself, so his proxy, Syd, gets the honors. Syd, in exchange, gets his schooling paid for...though he does owe his patron a debt of time as the whipping boy. But when things take a turn for the worse (Knox is basically convicted of vehicular manslaughter), Syd is sentenced to pay the ultimate price for him. The plan is how society functions, but it all goes south from there....at least in the eyes of Knox's father. I loved these characters. LOVED them. Syd is this wallflower type, who tries like the dickens to live under the radar. Knox is a spoiled rich kid. Then there's Marie...who Knox thought he'd killed. She's been a spoiled rich kid, but she has a conscience. 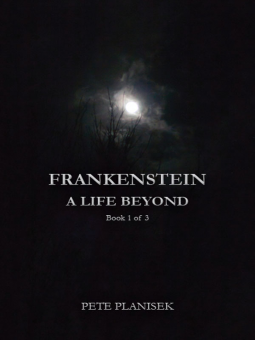 Syd comes out of his shell simply because he wants to live--even if living means having to give up his life to end the Patron/Proxy system and erase all debts for everyone. 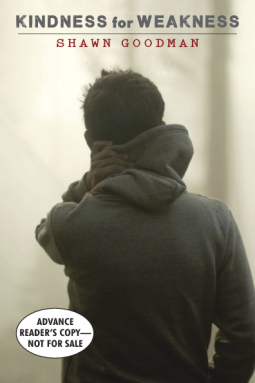 Knox is arrogant and spoiled and really only wants to get back at his cold-hearted father. Marie seeks a greater good for all, not just those who can afford it. All 3 have life-altering truths to learn about themselves, and the adults in their worlds. The story kept me going. It was twisting and turning, and frankly, I was up all night finishing this one. I was so enthralled that every little interruption to my reading was viewed as a personal insult. 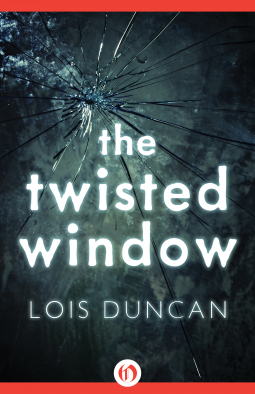 Each "chunk" of the story, the various scenes in it, had its own rising and falling action, with a climax that caught my breath. And every time I thought I had a couple pages to relax, I was wrong. It says quite a lot about Jeremy Johnson Johnson that the strangest thing about him isn't even the fact his mother and father both had the same last name. Jeremy once admitted he's able to hear voices, and the townspeople of Never Better have treated him like an outsider since. After his mother left, his father became a recluse, and it's been up to Jeremy to support the family. But it hasn't been up to Jeremy alone. The truth is, Jeremy can hear voices. Or, specificially, one voice: the voice of the ghost of Jacob Grimm, one half of the infamous writing duo, The Brothers Grimm. Jacob watches over Jeremy, protecting him from an unknown dark evil whispered about in the space between this world and the next. But when the provocative local girl Ginger Boultinghouse takes an interest in Jeremy (and his unique abilities), a grim chain of events is put into motion. And as anyone familiar with the Grimm Brothers know, not all fairy tales have happy endings. . .
Oh this was AWESOME. Seriously. I can't say enough good things about this story and the writing. First, Jeremy Johnson Johnson is an imperfect person and is aware of it...such a good thing to read (especially after reading a couple where the teen didn't think they could do any wrong, themselves). He's an anti-hero, if he's a hero at all. He doesn't see how great he is (I mean, his own mother left him) and his father won't work. Ginger, a fairly popular girl at school has taken a shine to him, and is really hoping to prove to Jeremy just how wonderful he is. Jeremy's otherworldly friend is Jacob Grimm (what an awesome idea!). 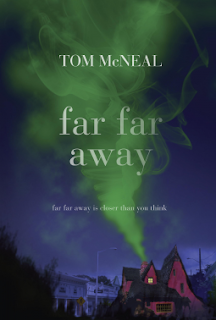 McNeal takes this twist, and builds a story that is very Grimmsian (to coin a word) in nature--there's a magical element, an unsuspecting village, and a dark mystery surrounding one of the best loved villagers. That was the best part for me--I felt like I was reading a modern-day Grimm fairy tale, where not every thing is sunshine and daisies. This is definitely one that should be on everyone's list!